Whether you are timing how long a task takes, counting down to stop an activity, or you’re just interested in how much time you are spending on a website, there is a Chrome timer extension for the job. Not only are these timer extensions useful, but they’re also entertaining and informational. This easy-to-use Chrome extension allows you to count up, count down, or both at the same time using hours, minutes, and seconds. For counting down, simply enter the start time for the countdown and click the “play” icon. Once the countdown is complete, a small notification will appear on your screen along with a short “ding” sound. You then have the option to reset the countdown timer to begin again or clear it completely. For counting up, simply click the “play” icon and the timer will begin. The counter will continue counting up until you click the “pause” icon. You can add several timers to run at the same time. Removing timers is easy and done so by clicking the “wrench” and then “trash” icons. Each timer can also be named differently by selecting the text beneath the numbers within the timers. To reset timers, just click the “stop” icon. This is a very simple extension for counting down time from one hour or less. 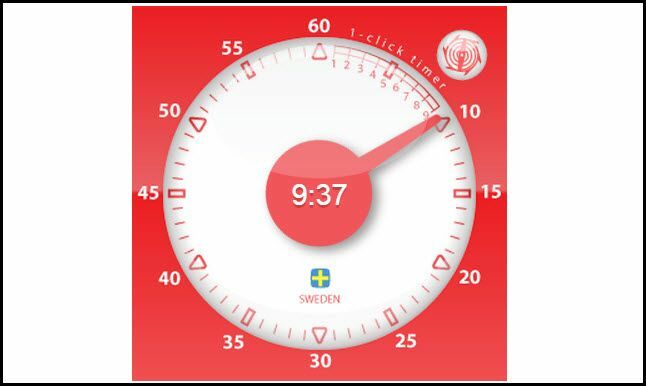 Once you select the 1-Click Timer icon from the Chrome extension toolbar, just move your mouse pointer to the desired start time and click your mouse button to start the countdown. While the timer is running a small rotating wheel appears at the top of the timer in the extension window. You can stop the timer at any time by clicking that wheel. The icon in the extension toolbar will show the time remaining in minutes, changing with each passing minute. Once the timer reaches one minute remaining the icon will begin to blink and show the remaining time counting down by seconds. When time is up, the icon changes to a bell and blinks faster. There is also a musical notification sound that will continue to play until you acknowledge it by clicking the extension icon. This handy timer shows the amount of time spent on each active tab in Chrome. 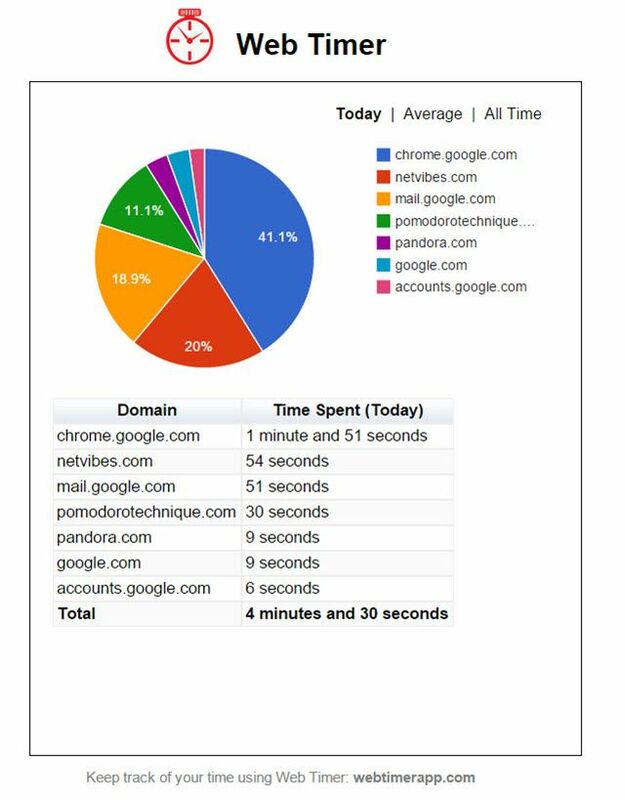 A pie chart is displayed showing the percent of time spent on each active tab along with a listing of each domain and actual time spent beneath it. You can easily switch between times for the current day, a daily average, or time over one day. Options for the timer include listing domains to ignore, a chart display limit count, or the option to clear the data. So, if you are interested in how much time you are spending on social media sites, for example, then this is a really helpful extension. This timer allows you to set a countdown from 25 minutes, ten minutes, or five minutes. Once you choose the timer option, the countdown automatically begins. If you leave the extension window open, you can see the Simple Pomodoro timer sliding as time ticks away. You can also reset it at any time by clicking the Reset the Timer button. When time is up, a notification appears on the screen and the timer plays a ringing sound. If you allow your children or grandchildren to play games online or access certain websites, then this Play Timer for Kids is a great way to let them know when play time is over. The timer counts down from a maximum of 90 minutes, but can be set to the minute. Just move the slider to the desired start time and click the Start Playing button. The countdown time will be displayed when the extension window is open, but will continue to run if you navigate away from it. When time is up, a chime notification sounds and the timer window shows “Time’s up!” You can click Cancel to start the timer again if desired. The timer has bright colors and the chime is soothing rather than startling for children. Another handy timer that can be used for children as well as adults is Sleeper. This timer will automatically close active Chrome tabs based on the settings you choose. 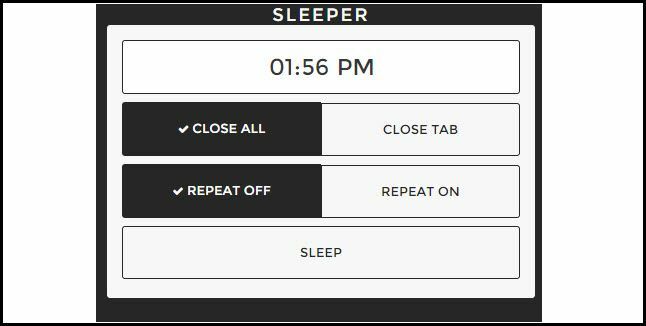 You just enter the desired time of day and then choose from closing the active tab or all tabs, select whether you want this action to repeat or not, and then click the Sleep button. The Sleeper extension icon will display as “On” when it has been set. Once the entered time arrives, the tab(s) you chose will close automatically. This Chrome extension provides a sure way for tabs to close automatically. So if you or your children are only supposed to visit a website for a specific amount of time, then Sleeper is quite useful. This timer extension is nice for playing your favorite music for workouts or even your mood throughout the day. The Musical Timer can switch music by the time of day down to the second. Upon installing the extension, it is filled with times, music selections, and comments which can be customized. 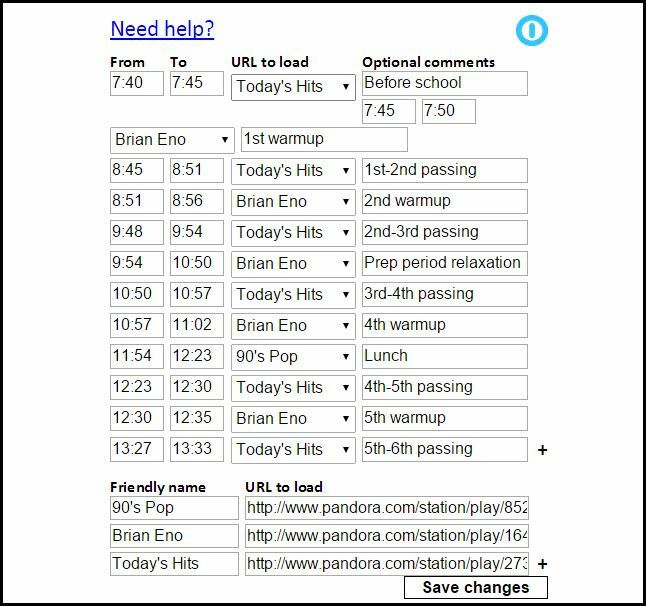 The defaults connect to stations on Pandora, but you change this by adding a Friendly Name and URL to Load for your desired music destination. Times entered are done in 24-hour time and the setup and editing is very simple. Musical Timer can be turned on or off using the “power button” icon at the top of the extension window. How Do You Time Your Activities? Are there other Chrome extensions that help you time your tasks or let you know when you have been doing an activity for long enough? Which alerts, reminders, and timers do you like? Share your suggestions below. We would love to hear from you!